Today: Molly Yeh of My Name is Yeh may be the most determined person we've ever known. We thank her for discovering the 300 ways that we shouldn't make Gushers. What’s that Thomas Edison quote about how he never actually failed at inventing something, he just found 10,000 ways of how not to make it? This was my life for the past month, but with Gushers. The tasty, chewy, forbidden-in-my-youth fruit snack that “gushes” with sweet juice when bitten into. Throughout the process, I asked myself time and time again whose idiotic idea it was to make these things, as it became clear that a homemade, vaguely accessible Food52 Small Batch-worthy Gusher would not be invented on my watch. I don’t know—I was on a high after my Funfetti experiments and I felt like I could conquer the world of 90s colorful sweets. And yet here I am with 300 ways of how not to make a Gusher; in their place I have one semi-homemade, time-sensitive hack that is probably better fit for Deranged Crafts, and a load of despair. So if you came here for a homemade Gusher recipe, there is kind of one at the end—with like 5,000 disclaimers. If you came here to read about kitchen experiments, and you also didn’t totally mind the non-closure at the end of Serial, you’re going to have a similar sensation here (on a much smaller scale). Maybe this will even spark your own experiments, and then you can be the one who brings a homemade Gusher into this world. Just give me a year to recover from all of this before you tell me about it. Alright, here’s what I was thinking when I told Food52 that I was going to make Gushers: syringes. Syringes paired with all of the pretty, homemade gummy recipes that I’d seen floating around Pinterest. Just make a ball of gummy, inject it with juice, patch up the syringe hole with a bit more gummy mixture, and voilà! This didn’t even make it to the testing phase because in some states, without a prescription (or illegal drug dealer connection? ), getting syringes is kind of difficult. I also couldn’t quite conceptualize making a gummy ball with a hollow center that would be a space for the filling. The first test that made it into my kitchen was inspired by Xiao Long Bao: Chinese dumplings that are filled with soup. How do you get the soup into a dumpling wrapper? You mix soup with gelatin to make soup Jell-O, fill the dumplings with cubes of the Jell-O, and then when the dumplings are steamed, the Jell-O melts into liquid. "Great!" I thought. Let’s take the temperature down a bit, freeze a Gusher filling, stick a cube of it into a homemade gummy (a mixture of gelatin, fruit juice, and sweetener), and then let it all sit at room temperature until the cube melts. Pour a thin layer of gummy mixture into the bottom of a large ice cube tray, let it firm up, place a small cube of filling on top of it, and then fill the rest of the tray up with more gummy mixture—similar to how you would make a peanut butter cup. Why this didn’t work: Once the first layer of gummy firmed up, it would not stick to the second layer of gummy. The innards oozed out, and everything fell apart. Fill an ice cube tray almost to the top with gummy mixture, let it set slightly, and then use tweezers to place a juice cube in the center. Let it firm up completely. Why this didn’t work: The cube either dropped straight to the bottom, exposing its bum on the underside of the Gusher, or, if I waited long enough to avoid total sinkage, the gummy mixture became too firm, and placing a cube in the middle of it left a hole in the top. One by one, dip the cubes into the gummy mixture, as if they’re chocolate truffles. Let the cubes get a nice, even coating of gelatin, and then repeat. Why this didn’t work: The gelatin layers were way too thin, they stuck to everything, they peeled off way too easily. I didn’t want to put you through that. After these attempts, I gave up on the Xiao Long Bao method because the tiny cubes were just too sensitive and fussy. I tried the second Xiao Long Bao test again but instead of placing cubes in the slightly firm gummy mixture, I injected the center of the gummies with jam, thinking that a little squiggle of jam would be more likely to float than sink. Why this almost worked, but didn't: A few of these kind of worked, but ultimately, they had to be nixed because of the too-small window of time in which I could safely inject a gummy without leaving a hole. Carefully injecting a whole batch did not seem like a reasonable thing to do. I made Gushers bars. This was similar to the first Xiao Long Bao method, but I thought that by exposing a bottom layer of gummy to more surface area of the top layer of gummy, there would be a better chance of them sticking to each other. So I poured a thin layer of gummy into a loaf pan, and right when it was firm enough, I piped out dollops of jam about an inch from each other and then poured down another layer of gummy. Once firm, I cut around the dollops of jam and had little pillows of gummy candy that were filled with squirts of jam. Why this almost worked, but didn't: It kind of worked! The problem was that they didn’t gush. Yes, there was a liquid inside of a solid, and those two textures were definitely present, but the inside of a Gusher should squirt out in your mouth—it shouldn’t just lay flaccid until you chew it up. Okay. So I tested each of these methods a bunch of times before I was faced with a giant, crying elephant in the room: It occurred to me that throughout all of this testing, I had not consumed one homemade Gusher. Nor had my husband, nor had my trusty assistant Kristin who stood by me through all of this. Yes, we put these in our mouths to test them, their Gusherability, their chewiness, their flavor. But after they gushed or didn’t gush, they all got spit out because they were gross nuggets of gelatin. Not one variation on the theme of homemade gummies tasted good or tasted like a Gusher shell, and I was too hung up on the process of getting the filling inside of it to realize this. I returned to the Xiao Long Bao: If my innards could be XLB-inspired, could my "outers" be as well? How about a dumpling wrapper? 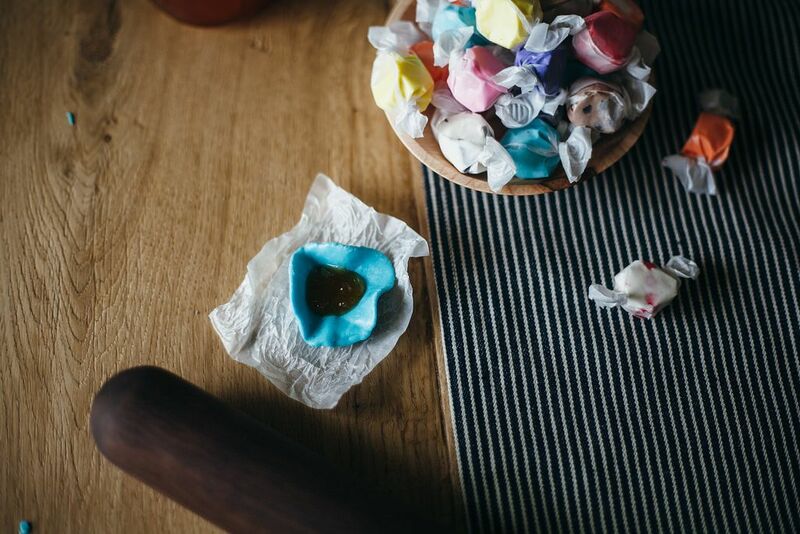 A homemade caramelized sugar dumpling wrapper? 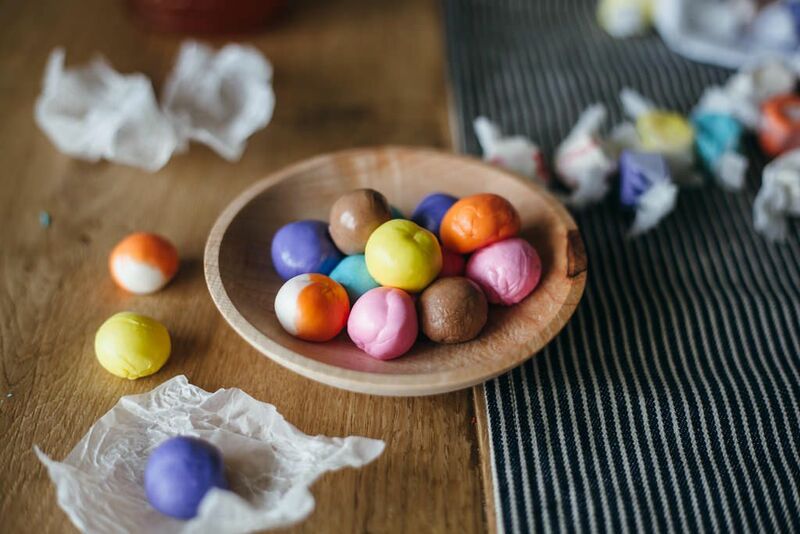 A licorice dumpling with a fruity, sweet center. Yes, let's test that! I made a batch of homemade licorice. I poured it out onto a large pan so that I would have a large, thin sheet of hot licorice, and then once it was cool enough to handle, I used a biscuit cutter to cut out circles. Then I wrapped the circles around frozen cubes of juice like a dumpling and let them sit until the juice melted. And guess what?! They gushed like Old Faithful, and eating each one was an exciting burst of near-success. I was so happy. And they tasted good! Really good. The problem: By the time I had made about four or five, the licorice had gotten too firm to handle. It was a messy process, and even if I had worked fast enough to use up all of the licorice, I probably would have only ended up with 18 little Gushers, max. Not worth the long licorice-making process. What was worse was that when I turned my back to start writing down my notes, all of the uneaten Gushers melted and bled out. The juice had dissolved. So, I needed to find two solutions: a less fussy, easier-to-handle outer shell, and a thicker, sturdier innard. I returned to the jam and my piping bag and went out to buy saltwater taffy. 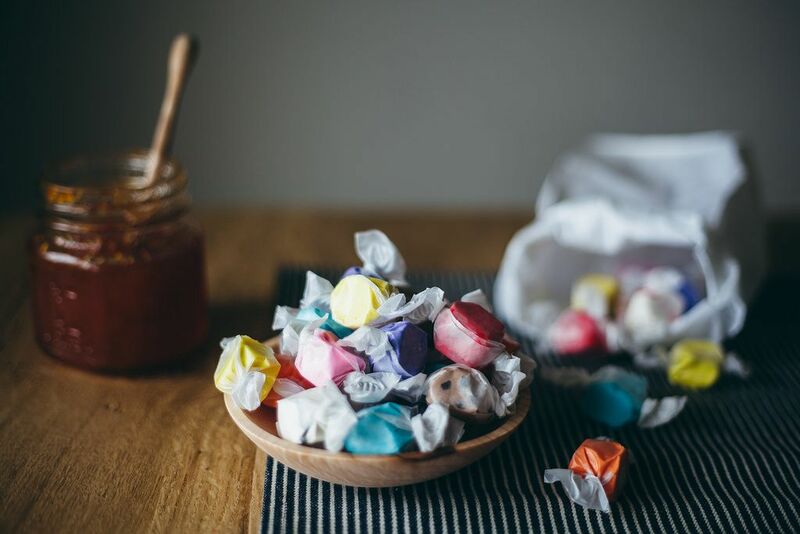 When I returned home, I rolled the taffy out into a wrapper, which I then rolled jam into. Within minutes, I had a pile of perfectly blobby Gushers. Semi-homemade, artificially flavored, gushy Gushers that last about an hour and are really quite weird when you think about it. 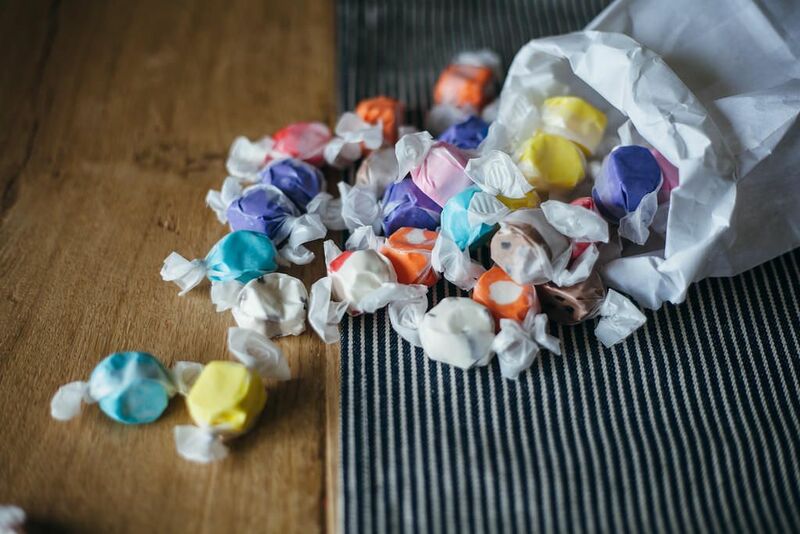 Because they’re just saltwater taffy and jam. But my deadline was near; I was exhausted of ideas, and so, so sick of putting things in my mouth and hoping they would gush. So friends, I am sorry to let you down, but consider this a head start on your future Gusher inventions. Godspeed. 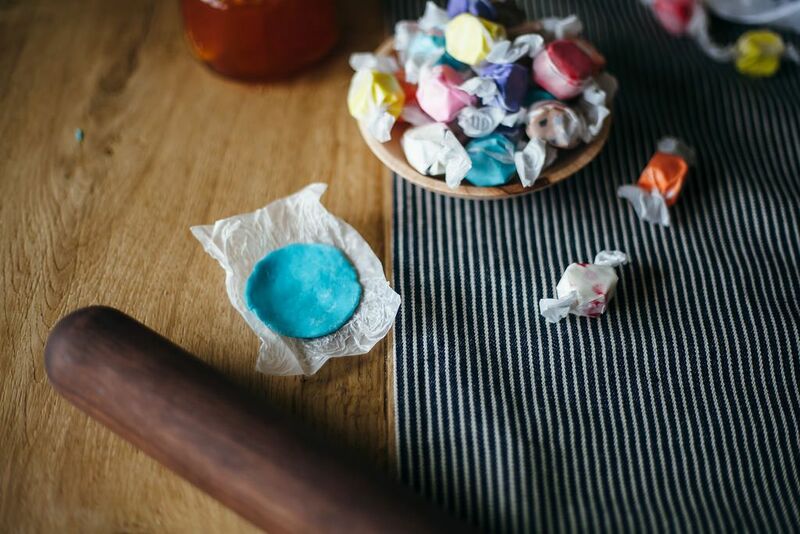 Roll out a piece of taffy into a circle. Place a blob of jam in the center. 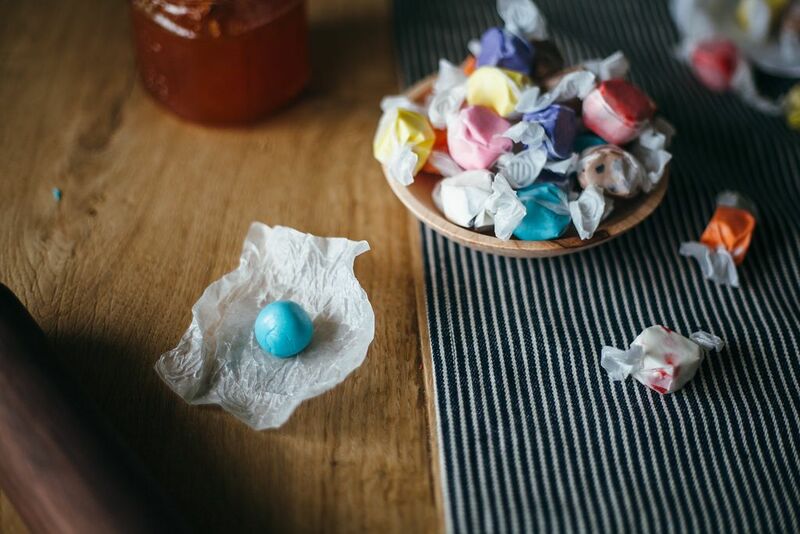 Pinch the taffy shut and roll it into a ball. See the full recipe (and save and print it) nowhere. molly yeh recently moved from brooklyn to a farm outside of grand forks, north dakota, where her husband is a fifth generation farmer. she writes the blog my name is yeh. Sorry if I said something out of line...don't remember the post. Thank you for removing it if it was offensive. I just saw the 2 year old comment...It reminded me of my military time...I am not a politically liberal person, I served in the Army...my family has served in the military since the Battle of Bennington in the Revolutionary War when the Colonies revolted from England. Snipers are people who are specially trained to shot long-distance targets in the military. I am proud of my service to my country as the men are proud of theirs. i forget that people are sensitive to normal talk due to un-natural reactions to the crazies who have been taking license with laws and the liberals who want to ban law abiding citizens from having firearms...weapons are used in war and law enforcement since we are dealing with semantics. Maybe I'm over-tired, but Molly figuring out gummies is me figuring out life right now. Actually you can get sugar to liquify at room temperature. Remember Cherry Cordials. You actually take a maraschino cherry, wrap it in fondant, coat it in chocolate, and let it "ripen". Takes about a week. Now let's say you make a flavored fondant, cut off a small ball, coat that in gelatin, let that ripen at room temperature, well you just might have it. Actually on second thought, I think I would amend my previous comment. The Fondant "melts" because it absorbs the moisture from the cherry it covers becoming liquid as sugar is hydroscopic. Therefore, take a small piece of fruit, cover that in a thin layer of fondant, make sure it is dry and cover that in gelatin. The fondant should absorb the moisture from the fruit, liquify, and become a gusher. If you really, really want to know how Gushers and other liquid filled gummies are actually made, read over the above patent. 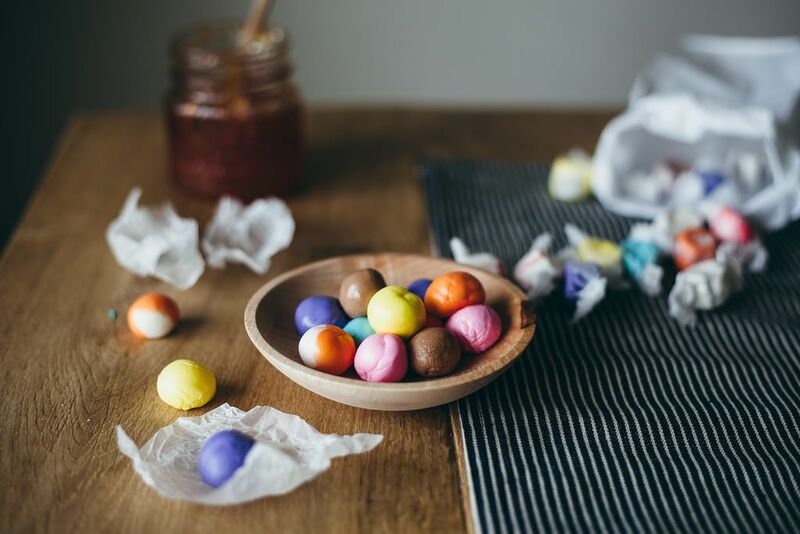 The CLAIMS section details the composition of the liquid and shell, and how the candy is made. 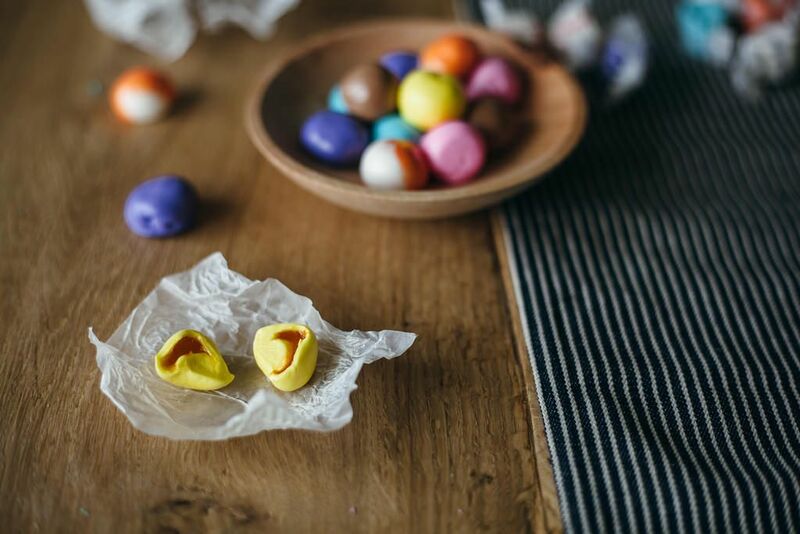 Make the outer shell without using taffy, make your outer shell and put in dumpling form. Then get unflavored gelatin, use your favorite flavoring or juice, melt the gelatin and juice together making sure to use enough gelatin so when cooled it is solid but jiggly (you may need to adjust how much gelatin to use). Put gelatin mix in center of candy and close it up. When is was young my grandma and mom would make this and when it cooled if was fun to eat by itself. They used fresh fruit that was in season, fruit juice or jello with extra gelatin. If we had celebrations at grandma's she would make a ton of these for everybody to enjoy. I hope this works for you and try experimenting to your taste (an adult treat is to use wine with the gelatin) but have fun. I am still laughing about the article and thanks for reminding me about grandms and the good times at her house. This is wonderfully hilarious. Thank you for sharing your wild ride of gummy! I am sharing this with my friends who might not have this. too funny. great tenacity. Were you ever a sniper? Oh my gosh, I love how realistically this represents the recipe development process! I am cry-laughing! If you still want to try the syringe method most states allow farm supply stores to sell syringes for animal care. They tend to have bigger bore needles but they are sterile. Now I am seized with the idea of somehow using tapioca balls and am not getting my work done! i am cracking up. "See the full recipe (and save and print it) nowhere." Oh what a great sweet read! Kudos followed by applause for making me smile and laugh with you. omg you are a shining beacon of tenacity and perseverance in this dark world.